I voted for the Doric. I love the geometric look to them! I have a "Pacemaker" that has been in my family forever. I am trying to learn more about them. I voted for the "Skyline", however, because I just acquired a demi in a lot of twelve miscellaneous pens at a flea market. The "Skyline" is very worn and brassy, very dirty, and almost a basket case. The dome is canted backward at a crazy angle, the top strap has fetched loose, the sac is brittle, the feed tube is brittle and broken, there are cracks in the plastic at the corners of the lever slot, and it looks like the point has been modified by a Soviet tractor mechanic. The teardrop is even off-center. I dipped it and found out that it writes like a dream. So now, I gotta try to fix it up. I will read everything I can find here and then begin to ask a lot of dang, dumb, daft newbie questions, taxing the patience of you informed and long-suffering folk. I just voted, and was surprised to see the top category of the the Skyline devotees. That model impresses me as being so ungainly looking, it just may be appealing, in maybe a Hudson Hornet kind of way. Anyway, my attraction is to the 20s era gold filled all metal pens, FWIW. Just picked up a #2, Greek key, plastic section model, the most common of the common, but, still, it is a nicely proportioned design. Now scheming for others. I need to look at Da Book re replacing the sac in the one I have, obviously petrified. Any hot tips for this? I hope this is a straightforward proposition. BTW, the filler lever on my pen bulges upward at its middle, rather than being flush with the barrel surface along its length. Is this proper? Doesn't seem correct, but, then again, I imagine that over forcing it on filling would bend it in the opposite direction. TIA for any guidance! I purchased a Skyline on ebay for $22 several months ago. The description said "writes" which it does beautifully - when dipped. I've sent it off to Richard Binder for resacing and should have it back next week! If the ink flows as smooth as the nib writes, this should be an everyday favorite. Way to go!. If Richard is doing the resacking I am sure you will be more than pleased. It is customary for those of us that think of ourselves as "professional" to go over the pen to be sure it is in great working order before sending it back home. I am sure you will be as pleased with it or more so after Richard works on it. May this be the first of many Wahl-Eversharp products you come to enjoy. Edited by Wahlnut, 14 July 2007 - 05:41. I am a fan of the old vestpocket type pens; both ringtop and clip type. I would be very interested in learning about what models and colors were done as vestpockets. Please tell your moderator what information you would like to see on the Wahl-Eversharp Forum. Vote for the items you most want to see posts about. I have opened this poll to replies, so if you want something else listed, just tell me soI can tailor the topics to suit your particular interests. That sounds like a pretty good start for a nice Wahl-Eversharp collection, Kelly. What part of the world are you in? Are there many estate auctions, flea markets, and antique malls where you live? Have you found them to be a good source for "our brand" in your neck of the woods? With Wahl-Eversharp the stylistics are very nice and make the pens interesting to collect, but the nib is the thing, even on the ugliest faded BHR, the TEMPOINT, WAHL, WAHL PEN, SIGNATURE, AND GOLD SEAL nibs were about the best around then and now. Sorry it's taken so long to respond - I'm too random in my approach to FPN. I've added some location info. to my tag. I'm living in SW Kansas and have for most of my life. It's not great fp hunting country, but I've had my best luck at estate auctions and usually I've found fp's are not advertised on the sale bills, unless there are large number. Some of my best auction finds: Waterman 452 in great shape exp. broken clip. ; Vacumatic dbl jewels lockdown filler three band w/flex nib in good condition exp. no barrel jewel or tassie; W/E 5th Ave; Lucky Curve BCHR rt in excellent condition exp. w/o nib; Skyline in gray; Parker 21; Skyline mp - all this was in two boxes of advertising pens/pencils that I won for a total of five bucks. Even though this was a wounded pen gathering, it was great a good day at the auction. My wife, who attends more auctions than I has found several pens for me, including a Duofold Sr. Black & Burgundy in ex. condition; a jade Sheaffer balance - the long thin model with almost perfect color and a stub nib, a striped duofold, a gf Parker 61 set in ex. 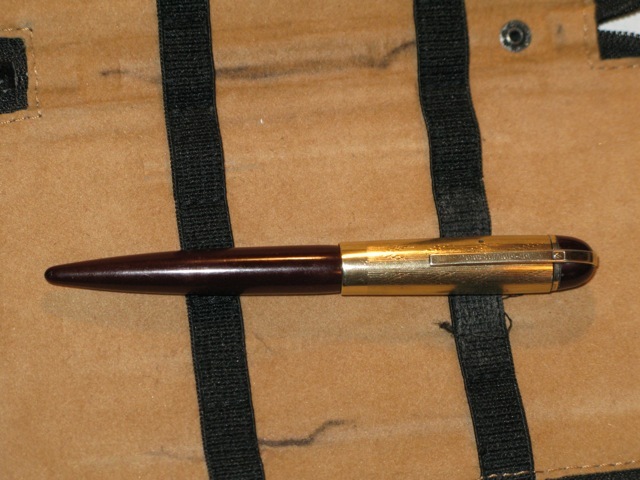 condition and several other lesser or more damaged pens. She is a great picker! I've a favorite antique shop that watch out for pens for me - he runs across some interesting examples from time to time, but nothing spectacular. I did buy a Wahl desk pen from him for six bucks - bronze and green, two band in pretty good shape. It took me another six months to find a correct trumpet and base off ebay, but it's a handsome desk set now. I wish I had more time to take in more auctions; there aren't that many out here, but every once in awhile you run across some great pens! I find the hunt is nearly as fun as the finds and it proves there are still some great pens in the wild. I had never contemplated getting one before, but I am very pleased with it. It writes very smooth and looks beautiful. My only comment on it is that I wished it had been larger - I like my pens slightly thicker and it is quite slim. I love the all metal pens. By far my favorite pen as a writer is a gold-filled #2 size with my favorite nib. It was fairly worn with a bit of brassing when I got it so I've never been afraid to use it, and I've carried it with me for years. I have another bigger one which shows almost no wear at all but it's not as satisfying a writer, though still excellent. My only wish is to have a silver one.. I think they look nicer than the gold or gold-filled ones. Silver ones seem much less common though, for some reason, and I have no idea what they're worth should one turn up. As many people here already know I have been collecting vintage pens for over 40 years and I made my first big purchases in 1967 by accident. In the group I purchased was a Wahl Rosewood deco band in fantastic condition. From then on I continued accumulating many pens and probably have owned over 300 Wahl pens. Years ago I traded away all of my metal Wahls as they were my least favorite pens. The man I traded them to gave me all of his Wahl parts which were considerable and have enabled me to put together any number of Wahl pens over the years. To this date my favorite Wahls are the Dorics followed by the "golden agers" - the gold seal models from the late 20's to the mid 30's. I love the Equi-Poised models and collected the complete set of Coronets. My interest more of less stops completely after the early years of the Skylines. In the last 10 or so years I have concentrated on desk sets so my Wahl desk sets are particularly a strong suit. I still cannot resist a fine desk set but I can resist the pens. I write with Doric desk pens in the office and carry adjustable nibed pens almost every day. Oh, I was able to find so many Wahls as I grew up only about 2 miles from the factory. On a typical weekend of looking for pens I would almost always find Wahls to add to the collection and in those days, many of us collected every model we could find, no matter the size or color. We tried to fill every gap in the models we were most fond of so having 36 red hard rubber models on display at one time was no big deal to me. Long live the Wahl Eversharp products!!! Don Lavin, co-organzer of the oldest pen show, the Chicago Pen Show, now entering its 30th year in 2010. The Skyline is iconic: nothing else like it. I missed a poll listing for the Oxford model, which might be included in terms I don't recognise. But Wahl Oxford pens are seen on auction sites frequently, and they offer a chance for the shoestring collector to restore a Wahl pen to excellent writing condition. Edited by freehand, 05 February 2010 - 03:01. I found this Skyline in an 'Antique' mall the other day. As I stated in another thread, I am a complete n00b when it comes to selecting vintage pens, so I just select them based on looks and pricepoint. This Eversharp was very tarnished, but I liked the design as I am a fan of all things Art Deco and the price was very low, so I bought it. The pen shined up fairly, the cap is loose, but it does write! I am a collector have serval Eversharps, have no idea what models I have a white one with a chrome wrap around the cap, the nib is somewhat recessed and very narrow. It does share a Parker logo also. Any ideas? I like to learn more about pens and the ones I am collecting. Like 72 others, I voted for the Skyline. I was tempted to say the Doric, but I can only admire them from afar since they appear to be a ways out of my price range. The Skyline I have been able to purchase. It has so much going for it for a newly interested person, like myself. About a jillion different configurations across three sizes; unique styling; writes well/nice nib. You can find other pens faceted like the Doric, but there isn't any thing that looks quite like the Skyline. I unfamiliar with some of the other models listed, so an "article" I think would be great would be a photo album showing a picture of each and listing the definitive or distinctive characteristics that set it apart from the others. Well, I see I really am in the minority here. I always prefer flat top pens to "streamlined" ones. I think Sheaffer started this "streamlined" nonsense with their Balance pens. Parker followed with their streamlined Duofolds, Wahl with their equipoise models, and Waterman, never too quick to change, ignored the fashion for the most part. I really hate the design of the Skyline. The cap looks too big, and sort of like an astronomical observatory, and the barrel is way too sharp and pointy looking. If the Sheaffer was named the "Balance", the Skyline should have been called the "Unbalance". But that's just my personal opinion, and like most Wahl-Eversharps, it writes beautifully and always came with a great nib. The price is also attractive - maybe because I am not alone in my opinion of its appearance. Look at Other pens of that era & you will see a natural progression from one model to the next all sharing similar concepts. The Skyline design came from nowhere (little to no precedent for its design existed before) but the overall concept was part of its epoch & drew style from its era. Its design came from questioning & analysis of the problems with a huge dose of genius. Its a truly remarkable piece of design. Unique. Courageous. So many designs now look like they were designed by committee, they have no soul. I'm interested in nearly all of them. I've only handled Oxfords & Skylines so far. My next quest is for Ventura & Symphony. Edited by Have Fun, 07 September 2010 - 21:50. Lots of interesting stuff about the well known Wahl Eversharp pens. Also anything about Mauric and other European Eversharps.